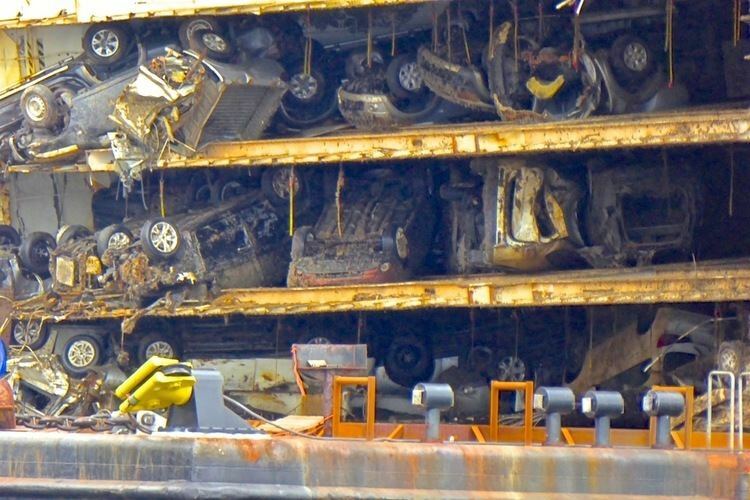 On 5 Dec 2012, Baltic Ace collided with the Cyprus-registered container ship Corvus J in the North Sea while underway from Zeebrugge, Belgium, to Kotka, Finland with a cargo of about 1,400 Mitsubishi cars likely headed to the Russian market.The incident took place some 40–50 kilometres (25–31 mi) off the Dutch coast south of Rotterdam on one of the busiest shipping lanes in the world at 18:15 GMT. Sources ascribed the cause of accident to be ‘human error’. Immediately after the collision, Baltic Ace began taking on water, capsized and sank within 15 minutes in shallow waters. There were human casualties too ~ Corvus J was severely damaged and her bulbous bow was bent, but she was not in danger of sinking and participated in the search for survivors. All vessels have an international duty to give reasonable assistance to other ships in distress in order to save life, but there is no obligation to try to salve the vessel. 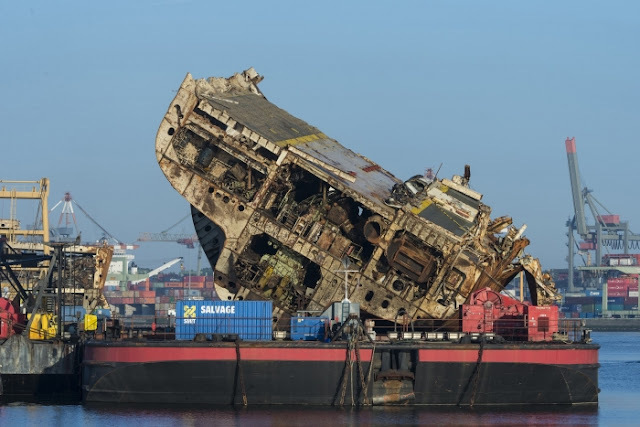 Any offer of salvage assistance may be refused; but if it is accepted a contract automatically arises to give the successful salvor the right to a reward under the 1989 Convention. Typically, the ship and the salvor will sign up to an LOF agreement so that the terms of salvage are clear. Since 2000, it has become standard to append a SCOPIC ("Special Compensation - P&I Clubs") clause to the LOF, so as to circumvent the limitations of the "Special Compensation" provisions of the 1989 Convention. "Salvors" are Professional seamen and engineers who carry out salvage to vessels that they do not own, and who are not members of the vessel's original crew. When salving large ships, they may use cranes, floating dry docks and divers to lift and repair submerged or grounded ships, preparing them to be towed by a tugboat. The goal of the salvage may be to repair the vessel at a harbour or dry dock, or to clear a channel for navigation. Salvage operations may also aim to prevent pollution or damage to the marine environment. 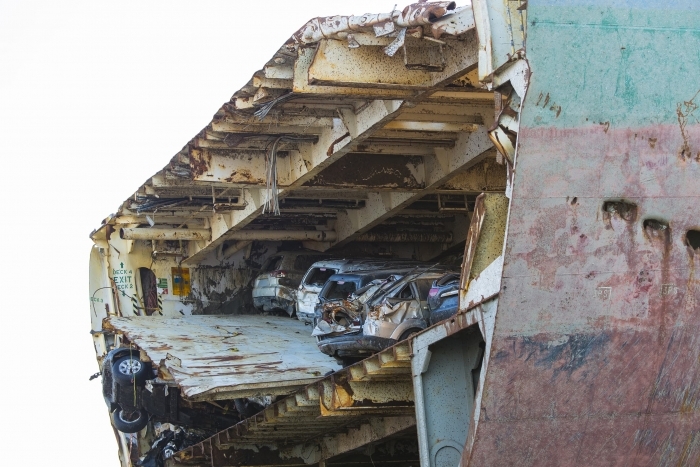 Additionally, the vessel or valuable parts of the vessel or its cargo may be recovered for resale, or for scrap. Smit Internationale N.V. (or Smit International) is a Dutch company operating in the maritime sector. The company was founded in 1842 by Fop Smit as a towage company with only the 140 horsepower paddle steamer tug Kinderdijk. It is now part of Royal Boskalis Westminster N.V. a leading global dredging and offshore contractor and maritime services provider. With origins in the Netherlands, they have been operating for over 100 years. The vessel in first para - MV Baltic Ace was a Bahamian-flagged car carrier that sank in the North Sea on 5 December 2012 after a collision with the Cyprus-registered container ship Corvus J. Built by Stocznia Gdynia in Poland, the ship had been in service since 2007. 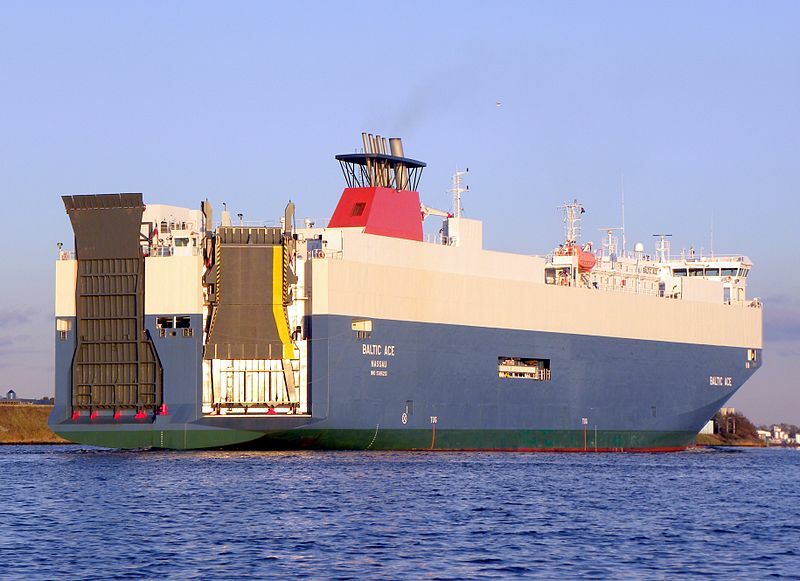 Baltic Ace was a car carrier, a roll-on/roll-off ship designed to transport vehicles in a large, fully enclosed garage-like superstructure running the entire length and width of the vessel. She had eight cargo decks of which two decks (3 and 5) could be hoisted up to increase the clearance of the decks below to 4.8 metres (16 ft) for large vehicles. Her car capacity, measured in RT43 units, was 2,132. 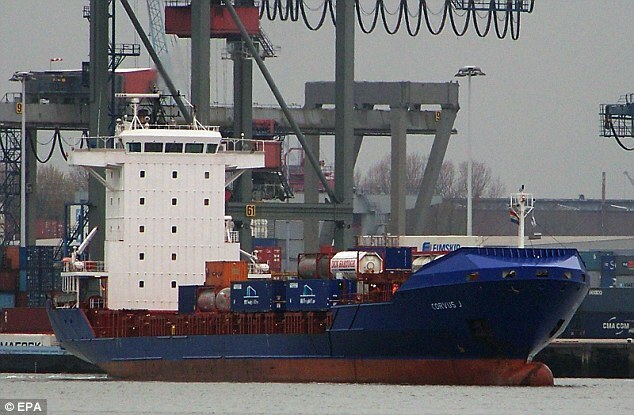 For loading and unloading cargo, Baltic Ace had a stern ramp for normal ro-ro berths and a stern quarter ramp for harbours with no specialized cargo handling facilities. She was propelled by a single 5.84-metre (19.2 ft) nickel-aluminum alloy fixed pitch propeller directly coupled to the main engine. Calling ports in the Baltic Sea regularly, Baltic Ace was strengthened for navigation in ice and held a Finnish-Swedish ice class1A. She was classed by Det Norske Veritas.After the collision, she went into the sea and was resting in sea bed – not so deep, estimatedly around a depth of only 35 metres with its cargo including 1400 cars – some costly luxurious ones .. .. there was also substantial quantity of oil, which created some disturbance to marine environmentalists. 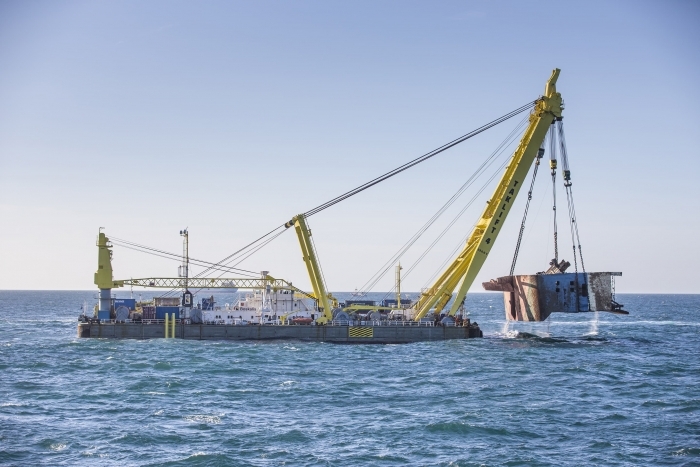 In Mar 2014, in its largest ever salvage award the Dutch Ministry of Infrastructure and the Environment contracted Boskalis and its partner Mammoet Salvage for the wreck removal operation. The concern was that the ship had some 540,000 liters of pollutants on board such as heavy fuel oil and lubricants and posed quite a threat to the environment. In addition, of course, there was also the petrol, oil, batteries etc. in the vehicles themselves. Furthermore, this is a very busy shipping lane so the wreck was certainly a hazard to vessels, given that it was so close to the surface. The wreck therefore was closely monitored by the Dutch and Belgian coastguard authorities. The contract was to be completed before end 2015 ~ North Sea offered its share of complications as work normally could be done only during Apr to Sept. For taking out the oil, the salvors used hot tapping with a heating system. In this process, the oil is heated with inserts in the bunker tank. Steam is run through these inserts, which are cylinders of 2 meters long and 30 cm in diameter. The steam plant was installed on a barge and provided constant heating to create the flow of oil in the tank. Once all remaining oil had been removed from the wreck, the vessel was cut into 8 separate pieces using a cutting wire and raised from the seabed. To cut a section of 25 meters wide and 25 meters high takes around 30 hours. The sections were then lifted with large sheerlegs onto a barge and taken to a recycling plant. For maintaining navigation hassle-free, the seabed had to be cleaned and grabs were used to retrieve the smaller parts and debris off the bottom. Divers cleared the remaining waste. 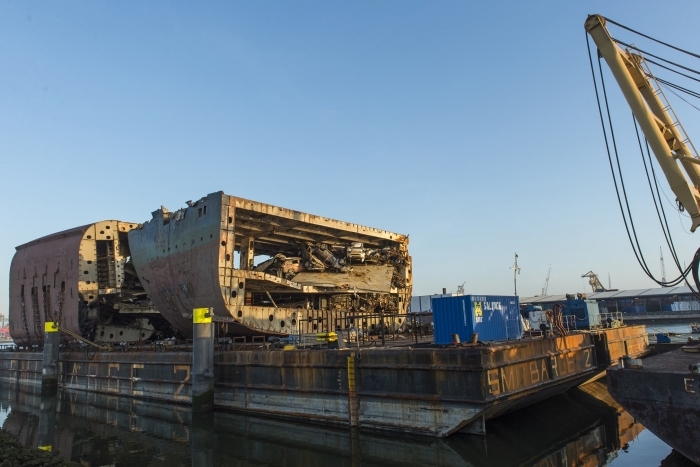 The salvaging of a sunken ship is certainly challenging and in this case the salvors - Boskalis Westminster N.V ensured a clean retrieval. PS : news collated from various sources on the web – pics credit : Boskalis, the salvor’s website.